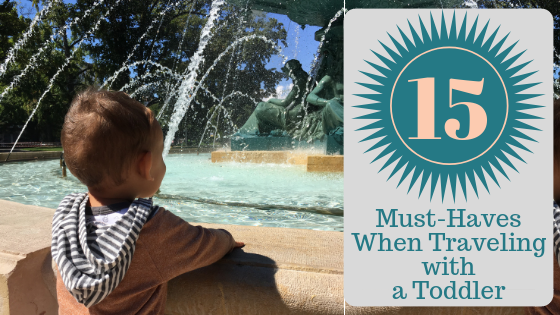 Traveling with a little one is no easy task. 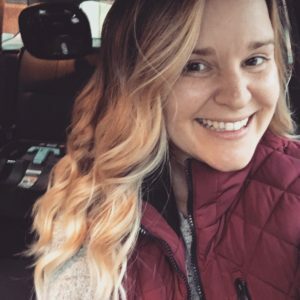 After surviving over 15 flights with our one-year-old, I have come up with a list of 15 items that have made our trips more comfortable, efficient, and enjoyable. I have learned to pack smart to prepare for all situations: flight delays, traffic jams, a cranky toddler, jet-lag, new environments, and anything else the universe throws our way. 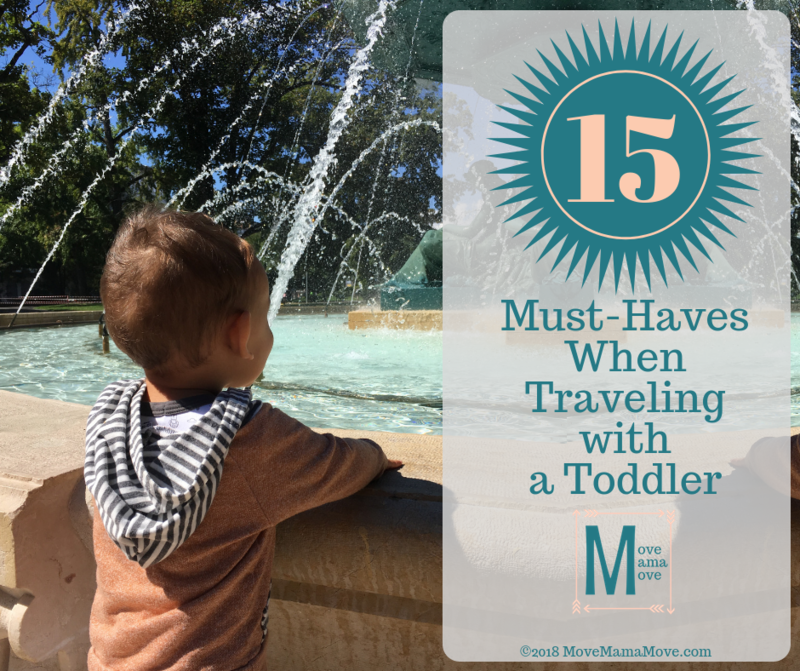 Use the items from this list to make your next trip with your toddler more enjoyable. Even though Chulengo is over a year old, I still use our nursing pillow every single day when nursing. As a Physical Therapist, I am obsessed with maintaining good posture while nursing. Sitting for long periods of time to nurse Chulengo is uncomfortable if I don’t have something to support my arms and I despise the mid-back pain that sneaks up on me when I have bad posture. Without proper support, I lean forward and round my back which leads to discomfort. So, when packing for our most recent trip, I panicked when I saw my nursing pillow take up an entire side of our small rolling suitcase. Instead, I found this inflatable pillow that fits perfectly, when deflated, in a pocket of the diaper bag. I can inflate the pillow in a few minutes and use it anywhere — on the plane or in our hotel room. Even though this is a nursing accessory, it also came in handy as a nap accessory. During our last flight, Chulengo slept comfortably on my lap for a couple of hours. He was able to rest on the inflatable pillow in my lap, which gave my arms a serious break. While researching every pack-n-play on Earth, I came across the Lotus Travel Crib. Holy moly this travel crib has been a lifesaver for us! It packs up small enough that we can wear it as a backpack. Or, we can pack it in our large suitcase, and it only takes up space one side. Having this travel crib made it so easy for Chulengo to sleep wherever we have traveled. We’ve taken this to visit family, to stay in hotels, and to contain Chulengo while we unpacked at our new apartment. The side door is a great perk. Sometimes, Chulengo needs a little extra soothing when he goes down to sleep. Instead of leaning over the pack-n-play for long periods of time, I can protect my back by lying next to him through the zippered door. The sheet is sold separately but fits perfectly around the mattress. Chulengo loves to toss his snack cup or sippy cup to the side when he’s finished. If I don’t watch carefully, he will toss it, and it will be long gone. I can’t tell you how many times I have picked a cup up off the ground when we are out for a walk. I probably lost over half a dozen cups before I found these helpful straps. I have started packing these straps when we travel. When on the plane, I strap Chulengo’s cup to his t-shirt or my bra strap, so it doesn’t fall on the disgusting airplane floor. When we are walking and exploring, I strap his cups to his stroller so he can eat and drink at leisure without my fear of losing a cup. Replacing a cup while traveling can be near-impossible. These straps have definitely come in handy. Packing cubes may be my #1 favorite item to help make traveling easier. I owe my wonderful friend Emily a HUGE thank you for introducing me to packing cubes a couple of years ago. I have a set of cubes for each person in our family. When packing, I sort items into the cubes to keep organized. For example, I separate Chulengo’s items into four cubes. One for pajamas and sleep sacks. Another for pants and shorts. A third for tops. And a final cube for miscellaneous items, like a jacket, blanket, lovey, burp cloths, socks, bibs and more. I can find things quickly and maximize space in each suitcase. When I first bought these cubes, my husband thought I was crazy. But, while packing for our last trip, he asked if I had any extra packing cubes he could use. These are a given when you are traveling out of the country. Different countries require different types of adapters, so it is important to research which kind you need before your trip. 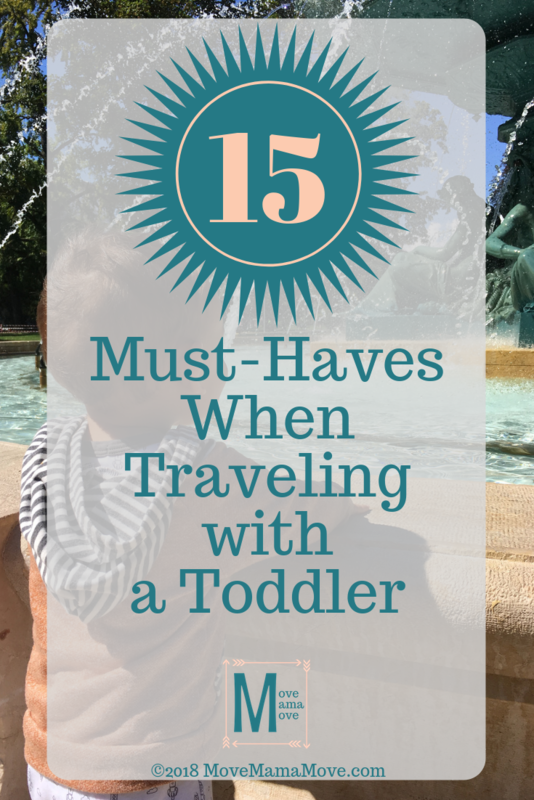 I didn’t realize how many I would need now that we travel with a little one. I made sure to pack one in each suitcase and carry-on bag, just in case any luggage got lost. I realize that I cannot keep Chulengo away from germs. But when we travel, I want to avoid getting sick at all costs. So when we travel (i.e., on a gross airplane), and need a quick clean-up solution, these travel-friendly containers are the way to go. While packing for our last trip, I put a mini canister of purell wipes in every suitcase and bag. I also attached a small hand sanitizer bottle to each bag we carried on the plane. This made it easy for us to clean up anytime we needed. When traveling, I have to keep track of so many items. I recently packed this toddler backpack for Chulengo to use as a snack pack. This was perfect for our trip. We could easily access Chulengo’s snacks and water cup. He could carry the bag if we needed to free up space. Remember a child’s bag should never weigh more than 10-20% of their body weight. Although, I always aim for 10% or less. The bag I purchased came with a leash, which we haven’t used yet. I still use this bag daily as a snack pack. Chulengo knows his snacks are inside so he can access them on his own. I spent so many hours researching travel strollers. My poor husband and Chulengo accompanied me to so many local stores to check out travel strollers. The strollers with the best reviews were also VERY expensive. We love our everyday stroller, so we planned to use a travel stroller a couple of times a month at most. I was dreading the thought of spending so much money on something that would get a little use. But, I found the best solution. The Contours Bitsy travel stroller was perfect for our trip, and it was a third of the price of the more expensive options. This travel stroller meets a lot of my wants and needs: is trifold, has a large sunshade, can recline the seat for naps, fits in an overhead bin of the airplane, collapses and opens with one hand, is lightweight, has durable wheels, and the leg rest is adjustable. We used this stroller on bumpy cobblestone roads every day during our last two-week vacation. My fitness tracker calculated over 20,000 steps per day, so this stroller got a lot of use but looks and functions like a new stroller. The one thing our travel stroller doesn’t have is a snack tray, like our daily stroller. So snack containers come in handy for Chulengo’s snack time. During our last trip, I would pack fruit or cereal for Chulengo to snack on later in the day during our excursions. I particularly like the snack packs that have the soft flaps for Chulengo to access food easily. Have you ever had to pick up a convertible car seat and carry it for any length of time? Even though we purchased a lightweight travel convertible car seat, it was big, awkward, and difficult to carry. I dreaded the idea of dragging Chulengo’s car seat through the airport. But, I came across this awesome car seat travel bag which makes carrying the car seat through the airport a breeze. It can be worn like a backpack and even has light padding to help protect the car seat from damage. You can read all my thoughts about this high chair in my review HERE. As you will see in my review, this travel high chair is amazing. We take it with us anytime we go out to eat with Chulengo. For travel, it fits easily in our suitcases and the basket under our travel stroller. It’s quick to assemble and easy to clean. I do recommend only using this high chair on a table that is sturdy and heavy enough to support an infant or small toddler. We have decided to use screen time as a special treat for Chulengo when traveling on an airplane. I went back and forth about what type of tablet to get for Chulengo. I finally decided to have him use my iPad, but I realized I needed to protect the tablet from his wild antics. This iPad case is economical, easy to put on, and durable. The handles make it easy for Chulengo to hold the tablet. The strap allows us to prop up the iPad for Chulengo to easily watch on a plane. It even comes with a screen protector, which I realized is also very important when I hand the iPad over to my son. When looking for a set of headphones for Chulengo I wanted something wireless and safe. These headphones were designed with kids in mind. Wireless was important — the last thing I need is Chulengo finding another cord to plug and unplug 50 times while getting upset that his movie keeps pausing because of the headphone jack. So, for Chulengo’s enjoyment and our sanity, we purchased a pair of wireless headphones that he can wear while watching his favorites shows. Because I am a slave to technology (who isn’t to some degree? ), my phone loses juice fast. I usually cannot get through a day without having to charge my phone. Granted, it is over three years old, and that is ancient in the technological world, but a charging pack is a much cheaper solution at this point than buying a new phone. I am obsessed with these charging packs. They last for hours! I can use this charging pack for a couple of hours each day and not have to recharge the pack it for at least a week. When we are traveling, we don’t always have access to outlets to charge our phones, but with these packs, we can access our phones at any time. This is helpful to look up itineraries, emails, reviews — anything to make our trip more enjoyable. Thank you! We love it too… easy to carry and protect the car seat! The inflatable nursing pillow is fantastic! I never even knew these existed. When we first flew with my boys they were 18 months, so we were no longer breastfeeding, but this would have been great for any kind of trip! I would have loved to have one in my diaper bag. My sister just found out she is pregnant, I will have to tell her to add that to her registry! Yes!! It is one of my favorite items for traveling…so convenient! I bet your sister would love it too! This is a great checklist. I’ve been looking for a good travel stroller and the contours bitsy sounds perfect. Great list. My kids loved the magnetic play sets when we traveled. Thanks! My son loves them too. That Lotus Travel Crib is amazing! Wish I had that a year ago!!! I think I need that I pad case for myself! Where are those cases available at? Isn’t it? The side door is key when I need to soothe my little guy in the middle of the night. My back is much happier than if I am leaning over the crib for a period of time. The ipad case I got and seriously recommend is on amazon here: https://amzn.to/2La4nFS It even comes with a screen protector which I have found helpful.